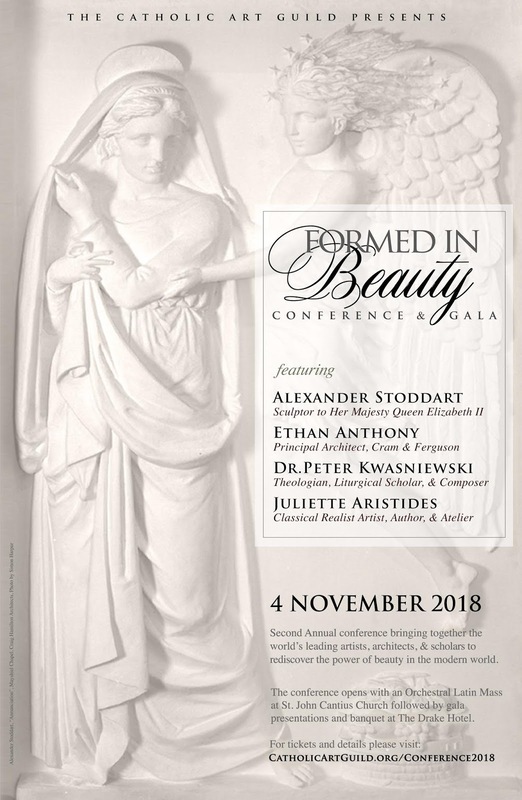 On November 4, the Catholic Art Guild will host its second annual conference with leading artists, architects, and theologians, to rediscover the power of beauty in the modern world. 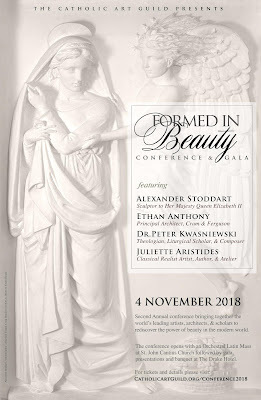 ​The one-day conference, entitled "Formed in Beauty," will feature Alexander Stoddart, Sculptor in Ordinary for Her Majesty the Queen in Scotland; Ethan Anthony, principal architect for Cram & Ferguson; Dr. Peter Kwasniewski, Thomistic theologian, liturgical scholar, and choral composer; and Juliette Aristides, Classical Realist Artist, Author & Founder of Aristides Atelier. The conference will open with an orchestral Latin Mass in the baroque splendor of Chicago’s historic St. John Cantius Church, with the Canons Regular who are well known for bringing beauty into worship. Conference presentations and discussions will take place at The Drake Hotel, followed by an elegant banquet and culminating in a stimulating panel discussion. Ticket sales help us to cover the cost of putting this and future events together for the Art Guild. We are extremely grateful for your support and hope you will join us for this amazing event! NB: Early-bird ticket special ends September 1, and those traveling from out of town should book hotel rooms ASAP so as to avail themselves of the special rate that ends a month before the event. Participants may also wish to consider coming in early for the annual Mozart Requiem on All Souls' Day at St. John Cantius. For more information about purchasing tickets, dinner, room reservations, and FAQs, please visit this link, or go directly to ticket sales (which repeats much of the same information).